I know that the Zetas have said, repeatedly, that all of Central America is a high danger zone, but could they please go into some more detail about what the individual countries can expect? Mexico and Guatamala have greater land mass, so presumably will have some safe zones. However, as one moves south, the land steadily narrows until it gets to Panama, a mere isthmus. I have many friends still living in Costa Rica and Panama, whom I have tried to convince to leave (as I did). But all have said, "no, I'm at high altitude, or in a non-volcanic zone, or it can't be that bad, or you're spouting too much doom and gloom, or it's happening in the Caribbean islands, not here on the mainland", etc. etc. denial, denial. 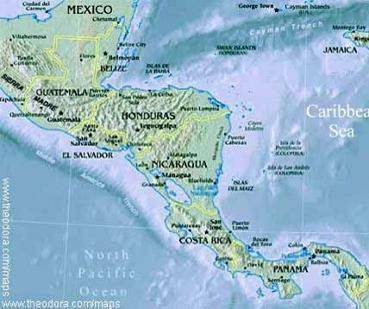 Are there any survivable areas at all in either Costa Rica or Panama, and if so, where exactly? Some of these people are at least open-minded enough to be following your weekly newsletter and would read about safe zones (if any) that they could head toward. And if they read descriptions of events that are pointedly closer to home (combined with the upcoming 7 of 10 events), maybe they'll finally be convinced. Where have we failed? We have used words like fractured, crumbled, crunched, experiencing great trauma, dragged along, or ground up. In addition to what will happen to the land mass, we have mentioned exploding volcanoes very near at hand, and water rushing completely over such lowlands as the Yucatan and Panama. How have we failed to relay what is coming? If total destruction does not occur during the 7 of 10, it will during the hour of the pole shift if not before that time. We have described the 7 of 10 as moving the top of S American Plate 250 miles to the west. Not all this movement involves S America, due to adjustments elsewhere, but nevertheless Panama and Costa Rica will be crushed during the 7 of 10 by the grinding movement of the hump as the great S American Plate grinds over it. Does this bring to mind a ride in a car with a bad set of shocks? The land before you will heave up, up to several hundred feet high, and tumble toward you. This is an example of what we mean by "crumbled". Landslides caused by rain and steep hillsides is not a preview of what to expect! The entire mountain may sheer off and slide into valleys, crushing not just a village or road but all civilization for dozens of miles in either direction, buried under so much rock that rescue is unthinkable. Valleys will simply fold, the mountain ranges coming together and squeezing all life out between them. Guatemala, El Salvador, Nicaragua, and Honduras hardly fare better, though the hump of S America does not grind over them. Rock strata torn apart is not local, but has a reach. They will crumple also, but to a lesser extent during the 7 of 10.